Paths represent the geometry of the outline of an object, defined in terms of moveto (set a new current point), bearing (set a new orientation), lineto (draw a straight line), curveto (draw a curve using a cubic Bézier), arc (elliptical or circular arc) and closepath (close the current shape by connecting to the last moveto) commands. Compound paths (i.e., a path with multiple subpaths) are possible to allow effects such as "donut holes" in objects. The definition of the outline of a shape. See Path data. Error processing for svg-path is done according to Path Data Error Handling. Path data animation is only possible when each path data specification within an animation specification has exactly the same list of path data commands as the ‘d’ attribute. If an animation is specified and the list of path data commands is not the same, then the animation specification is in error (see Error Handling). The animation engine interpolates each parameter to each path data command separately based on the attributes to the given animation element. Flags and booleans are interpolated as fractions between zero and one, with any non-zero value considered to be a value of one/true. The initial value, (none) indicates that the path element is valid but does not render. A negative value is an error (see Error handling). Support turtle-graphics-like current rotation in path syntax. We will add a path rotation command. Make path rotations easier to animate and pie charts easier to draw. A path is defined by including a ‘path’ element which contains a d="(path data)" attribute, where the ‘d’ attribute contains the moveto, bearing, lineto, curveto (both cubic and quadratic Béziers), arc and closepath instructions. Path data can contain newline characters and thus can be broken up into multiple lines to improve readability. Newlines inside attributes in markup will be normalized to space characters while parsing. For most commands there are absolute and relative versions available (uppercase means absolute coordinates, lowercase means relative coordinates). Relative path commands are also influenced by the current bearing, which is an angle set by the bearing commands. 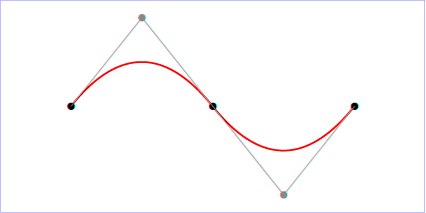 This allows for paths to be specified using a style of "turtle graphics", where straight line and curved path segments are placed with their starting point at a tangent (or at some other angle) to the current bearing. In the description of the path commands, cpx and cpy represent the coordinates of the current point, and cb represents the current bearing. m (relative) moveto (x y)+ Start a new sub-path at the given (x,y) coordinates. M (uppercase) indicates that absolute coordinates will follow; m (lowercase) indicates that relative coordinates will follow. If a moveto is followed by multiple pairs of coordinates, the subsequent pairs are treated as implicit lineto commands. Hence, implicit lineto commands will be relative if the moveto is relative, and absolute if the moveto is absolute. If a relative moveto (m) appears as the first element of the path, then it is treated as a pair of absolute coordinates. In this case, subsequent pairs of coordinates are treated as relative even though the initial moveto is interpreted as an absolute moveto. When a relative m command is used, the position moved to is (cpx + x cos cb + y sin cb, cpy + x sin cb + y cos cb). If the previous command is complete , that is that all the required coordinate data has been supplied, then an automatic straight line is drawn from the current point to the initial point of the current subpath. This path segment may be of zero length. If the previous command is missing required coordinate data then the initial point is used to fill in the missing data (but only for the last point or points). m 100,100 50,0 0,50 z: Implicit l command complete, z causes a straight line to be drawn resulting in a closed triangular path. m 100,100 a 50,50 0 0 1 100,0 z: a command complete, z causes a straight line to be drawn resulting in a closed semi-circular path. m 100,100 a 50,50 0 0 1 100,0 50,50 0 0 1 z: Second set of coordinates for the a command missing final point, z causes initial point to be used as final point resulting in a closed circular path. m 100,100 a 50,50 0 0 1 100,0 c z: c command missing three coordinates, z causes initial point to be used as coordinate data for all c coordinates resulting in a closed semi-circle. Visually c z is the same as z but may be useful in animating path data. SVG 2 adds the ability to fill in missing coordinate data with the Z or z command to avoid the need to add a zero length (or very short in the case of relative paths with rounding errors) path segment to close a subpath. This can effect the number of markers drawn and their orientation at the beginning/end of a closed subpath. The use of Z or z to replace missing coordinate data with the coordinate of the initial point in a subpath was resolved at the Sydney (2015) meeting. If a "closepath" is followed immediately by a "moveto", then the "moveto" identifies the start point of the next subpath. If a "closepath" is followed immediately by any other command, then the next subpath starts at the same initial point as the current subpath. The current bearing does not affect a z command. z closepath (none) Close the current subpath by connecting it back to the current subpath's initial point (see prose above). Since the Z and z commands take no parameters, they have an identical effect. h (relative) horizontal lineto x+ Draws a horizontal line from the current point. H (uppercase) indicates that absolute coordinates will follow; h (lowercase) indicates that relative coordinates will follow. Multiple x values can be provided (although usually this doesn't make sense). An H or h command is equivalent to an L or l command with 0 specified for the y coordinate. At the end of the command, the new current point is taken from the final coordinate value. v (relative) vertical lineto y+ Draws a vertical line from the current point. V (uppercase) indicates that absolute coordinates will follow; v (lowercase) indicates that relative coordinates will follow. Multiple y values can be provided (although usually this doesn't make sense). A V or v command is equivalent to an L or l command with 0 specified for the x coordinate. At the end of the command, the new current point is taken from the final coordinate value. When a relative l command is used, the end point of the line is (cpx + x cos cb + y sin cb, cpy + x sin cb + y cos cb). When a relative h command is used, the end point of the line is (cpx + x cos cb, cpy + x sin cb). This means that an h command with a positive x value draws a line in the direction of the current bearing. When the current bearing is 0, this is a horizontal line in the direction of the positive x-axis. When there is a non-zero bearing, a mnemonic for the h command could be "head this distance at the current bearing", rather than "draw a horizontal line". When a relative v command is used, the end point of the line is (cpx + y sin cb, cpy + y cos cb). When a relative c or s command is used, each of the relative coordinate pairs is computed as for those in an m command. For example, the final control point of the curve of both commands is (cpx + x cos cb + y sin cb, cpy + x sin cb + y cos cb). When a relative q or t command is used, each of the relative coordinate pairs is computed as for those in an m command. For example, the final control point of the curve of both commands is (cpx + x cos cb + y sin cb, cpy + x sin cb + y cos cb). 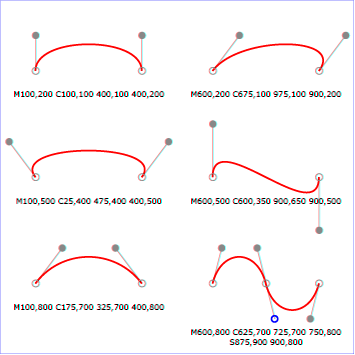 Make it simpler to draw arcs in SVG path syntax. Make arcs in paths easier. To make it easier for authors to write path data with arcs by hand. When a relative a command is used, the end point of the arc is (cpx + x cos cb + y sin cb, cpy + x sin cb + y cos cb). The effective value of the x-axis-rotation parameter is also affected by the current bearing: it is computed as x-axis-rotation + cb. Update for new 'Z'/'z' behavior. SVG path data matches the following EBNF grammar. If path data not matching the grammar is encountered, then the path data is in error (see Error Handling). Certain line-capping and line-joining situations and markers require that a path segment have directionality at its start and end points. Zero-length path segments have no directionality. In these cases, the following algorithm is used to establish directionality: to determine the directionality of the start point of a zero-length path segment, go backwards in the path data specification within the current subpath until you find a segment which has directionality at its end point (e.g., a path segment with non-zero length) and use its ending direction; otherwise, temporarily consider the start point to lack directionality. Similarly, to determine the directionality of the end point of a zero-length path segment, go forwards in the path data specification within the current subpath until you find a segment which has directionality at its start point (e.g., a path segment with non-zero length) and use its starting direction; otherwise, temporarily consider the end point to lack directionality. If the start point has directionality but the end point doesn't, then the end point uses the start point's directionality. If the end point has directionality but the start point doesn't, then the start point uses the end point's directionality. Otherwise, set the directionality for the path segment's start and end points to align with the positive x-axis in local coordinate system. A "moveto" or "bearing" operation within a ‘path’ element is defined to have zero length. Only the various "lineto", "curveto" and "arcto" commands contribute to path length calculations. Returns the (x,y) coordinate in local coordinate system which is distance units along the path, utilizing the user agent's distance-along-a-path algorithm. The distance shall be clamped to the range [0, total-length-of-path] before passing it to the distance-along-a-path algorithm. If no valid path data exists, returns (0,0). The returned point in local coordinate system.